delivery of arms and materiel to landing troops operating ashore by shipborne helicopters and amphibious vehicles. The ship is capable to transport 450 (in overload state – up to 900) marines and 40 tanks or 70 trucks. Looks pretty good at first sight. But those are specifications given by advertising literature. Really, the ship cannot accommodate "40 tanks" in principle. The point is that armored vehicles are transported in the dock section (10 vehicles) and in the hangar's first level (3 vehicles). And take note, there are no room remained for any amphibious means! Thus and so, heavy equipment can be only disembarked via onboard ramp. But this is possible only with prepared quay of certain height. Armored vehicles cannot be placed on the hangar's second level because of the ship's stability and strength of decks. In addition, size of the second level's ramp is too small for that. Armor is delivered to the land by 4 medium landing crafts LCM (almost analogous to those delivered landing troops to Normandy in the legendary D-day), 2 air cushion landing crafts LCAC or 2 landing catamarans L-CAT. LCM is capable to deliver one Leclerc class main battle tank (weight about 55 tons) or 60 marines at one trip with the max speed of about 9 knots. LCAC also accommodates one tank, but can contain 180 marines instead and moves faster – its full-load speed exceeds 40 knots. However, the French don't have air cushion landing crafts so far; Mistral was only tested with such vessels. There is only one prototype L-CAT as well. Judging by advertising information, it is capable to carry 100 tons of cargo, and the full-load speed is about 20 knots. According to open sources, it is allowed to conduct helicopter takeoffs and landings at sea disturbance up to force 5, and use landing crafts – up to force 3 (while more intensive disturbance the landing craft may strike the dock aperture's top edge). It is not quite clear what amphibious crafts would be based in the Russian Mistral. Four Sernas (Project 11770 landing boat, carrying capacity is one T-80 main battle tank or two BMP infantry combat vehicles or two BTR armored personnel carriers or 92 marines, speed is 27 knots at force 3 disturbance) cannot be placed in the dock section, only two. Serna is a bit shorter than LCAC but more than twice narrower, so interior volume of the dock section would be used non-optimally at all. We don't have suitable air-cushion boats either – the dock passage height won't fit our Kalmars and Murenas. Therefore, we either have to redesign the Mistral project for Russian landing crafts, or develop new ones, or buy old-fashioned amphibious boats along with the ship. Personnel can be also landed by helicopters based onboard Mistral. Standard air wing consists of 8 attack helicopters Tiger and 8 transport helicopters NH90 (up to 20 armed marines can be placed in the cargo section) and varies depending on the assigned task. Being armed with attack weapons on the pod to be used against coastal targets, our Ka-29 may carry 16 marines. Hangar's size is enough to accommodate up to 10 helicopters. There are 6 heliports on the flight deck. Helicopter parking at other places is not provided; exception is a space near elevator behind the island (enough for 1 or 2 helicopters). So, if the ship carries 16 helicopters, flights can be only performed by timely takeoffs to clear the flight deck. That means the ship's transport capabilities are higher than the operational ones. Helicopters get on the flight deck by means of two hawser-type elevators (starboard and stern) with lifting capability of 13 tons each. Hangar is situated directly under the flight deck; its height is 6.45 meters. That quite conforms to standards for Russian deck-based helicopters. But there are some concerns over starboard elevator; Ka-29 and Ka-52 will unlikely go into it because of their wide pods. Namely, without serious adaptations, those helicopters can be lifted only by stern elevator. Maintenance and repair zones are also located in hangars; there are telphers for large cargoes on the ceiling. Hangars are equipped with tow trucks and fire vehicles. Two aircraft fuel main tanks are located in the ship's aft underwater part. Tanks are in-built because of helicopter fuel parameters different than the Russian ones (higher flash point). Thus, once Mistral would be equipped with Russian helicopters, the whole fuel storage and supply system must be adapted for our standards. Speaking of real combat capabilities of Mistral, little calculation brings to the following. During the first assault "wave" only 2-4 main battle tanks (or 4-8 armored personal carriers) and about 120 mariners will be delivered to an unequipped coast. Or somewhat 400 troopers without tanks and reinforcements. So, anyway landing from Mistral will be carried out in several "waves" and of course simultaneously with transport helicopters and armor-carrying barges. Basically, there's nothing fearsome here. But one should keep in mind that Mistral is not an independent unit in French Navy. Mistral would unlikely tasked to seize a beachhead alone, without escorts trying to suppress enemy's coastal defenses and protect the ship from potential countermeasures, and without landing ship Foudre which has much greater landing capabilities. Alone, Mistral is absolutely vulnerable. The ship's self-defense weapons are only four 12.7-mm machineguns and two Simbad SAM launchers. As of killing range and altitude, Simbad system is analogous to our Gibka, although yields in other capabilities. Provided by the project, two 30-mm Breda Mouser guns are not mounted for some reason. It is absolutely obvious that Mistral has no space for installation of more powerful arms. Thus and so, the ship's air defenses must be laid only upon escorts. It is also noteworthy that the ship's sizes and huge flat freeboards inevitably increases radar signature. At the same time, Mistral has no means to reduce or distort the ship's "radar silhouette". 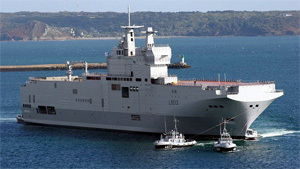 So, it goes absolutely apparent that types and amount of arms mounted on Mistral are dictated by the ship's main purpose – transportation and debarkation of troops preferably on equipped coast without enemy counteractions. This suggestion is also confirmed by azipod-type rudder propellers mounted on the ship. In combination with bow thruster, they make possible to pass through narrow waters and fairways of any depth-suitable port without tugs, sail round marked nests of mines and other obstacles (sunken ships etc. ), overcome drifting problems related to windage of high freeboards, and moor at debarkation quays. Of course, enemy fire is absolutely unacceptable while these maneuverings. That is by no means a landing operation but only troop debarkation in seized and secured port. In the case of real landing assault, Mistral is unadvisable to approach to enemy coast land closer than the visual range. Landing party is to be delivered by amphibious vehicles and helicopters. Nonetheless, any landing operation will be inevitably followed by armed encounter even in local conflicts with third world countries. Losses will be inflicted both during troops transportation by fossil low-speed pontoons throughout twenty miles (the ship could not get closer due to high probability to catch an antiship missile or run into mines) and while landing from large transport helicopters. The ship can be also damaged after all. In this case Mistral's survivability immolated to her cost and comforts can be fatal. And there is little wonder, since Mistral project was designed under Ro-Ro Passenger Ship and Special Service Military Ship standards of certification group Bureau Veritas; thus, virtually Mistrals are civil vessels mobilized for transportation of troops and armor, i.e. common troop-carriers! By the way, Mistral has only one machinery compartment. This fact has cut the ship's survivability to the bone but simplified the designers' work because it optimized usage of spaces by more rational layout of flues. There are no torpedo defense and collision protection at all. As long as the ship's hull was designed under ideology and strength standards applied for civil passenger-and-freight ferries, it comes natural that such factors as nuclear explosion or underwater burst were not considered. Note, this must be necessarily taken into account while designing of a warship. It follows that Mistral by no means covers special requirements of Russian Navy. Of course, all abovementioned things should not cast a slur on French designers' reputation. They have build a ship meeting technical specifications and within the customer's financial capabilities. Some technical and technological solutions applied in the ship excited great interest of our experts during Mistral's visit to St. Petersburg. Naval servicemen also have something to learn from French colleagues like arrangement of daily duties and leisure activities. However, in general, Mistral is conceptually elaborated and well-balanced project oriented on certain regions and tactical tasks assigned for French Navy. This is an expeditionary transport craft good in counterinsurgency warfare in distant regions and as a command ship. Proceeding from these tasks, requirements for combat component of the ship have been minimized (just because bushmen have no operable fleet in inventory so far). Mistral's landing capability is quite limited; survivability has been significantly decreased for the sake of improved living conditions. What we have de facto is a ship for peacetime and police operations. The ideology of such ship is contrary to principles and tactics of Russian marines. In Soviet Navy prevailed a view that landing operation should be carried out abreast – a full-fledged unit with all appropriate reinforcements. So, by commissioning Mistral in Russian Navy, we will slither down to primitive use of transport crafts capable only to disembark relatively big troop formations on prepared and secured coast. Another task which Mistral is allegedly capable to perform in Russian Navy is securing of mining explorations at continental shelf in Arctic (one of Russia's strategic zones containing about 13% of world's unexplored oil reserves and up to 30% of world's natural-gas reserves)… Sounds fantastic? Nevertheless, the words of Navy Main HQ Deputy Chief Vice Admiral Oleg Burtsev can confirm this assumption. According to him, the Mistral class ships are going to be based neither in Black Sea Fleet nor in Baltic Fleet but in Northern and Pacific ones. Without getting into tactical details like how could marine battalion secure our shelf, we'd better get down to technical issues. It comes absolutely obvious that without radical re-design Mistral class ships can not serve in northern waters! First of all, the hull itself is not meant for ice navigation; these ships are not ice-class vessels so it is impossible to use them properly not only in Northern Fleet, but in Baltic and Pacific ones either. Besides, Mistral has large moving bulb and such shape of underbody that leads to substantial unreasonable growth of ice loads. But all that is about the hull design; such things may not catch eyes at first sight, especially when you're not expert. However, what is seen with the naked eye is that the ship's dock section and hangars for armor vehicles are a "pass thru" open space, because boards have numerous apertures there. So, the dock section can be washed by waves. Of course, this may happen rarely as all sea inlets are located pretty high from the surface. But what will definitely occur is sweating inside hangars and further frosting-up of vehicles. By the way, as for the ship's performance characteristics reported even in official sources, Mistral can normally operate at outside air temperature from -10 °Ñ to +35 °Ñ and seawater temperature from -2 °Ñ to +32 °Ñ. Technical solutions applied in the ship are determined by climatic conditions of French Navy's operational zone. Mistral philosophy implies troop projection and operations in France's transmarine dominions. So, designers considered landing tactics and the ship's service environment customary for French Navy.